of Okinawa begins. This would be the largest amphibious assault inthe Pacific theater. Navy carrier-based Pilots will face Kikusui the first of massive raids sent to destroy the American invading Task Force. Over the next 83 days, Hellcat squadrons will claim 837 enemy aircraft destroyed. Flying F6F Hellcats Ensign Bill Hardy and his wingman are Flying RAPCAP over a Radar Picket ship north of Okinawa. They intercept Japanese aircraft and shoot down two escorting aircraft and four Kamikazes. Bill is credited with four of the enemy aircraft destroyed, two Vals, one Judy and a Zeke. 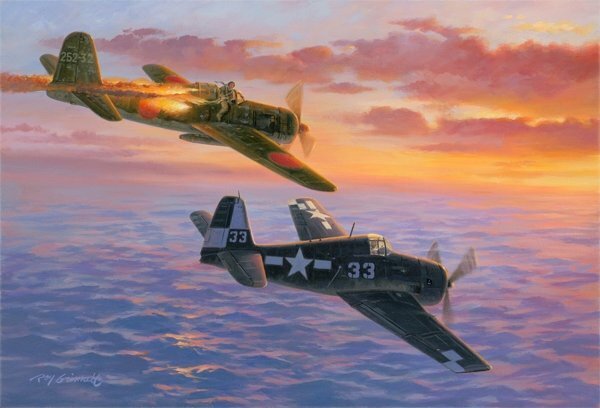 At about sunset the two pilots are vectored to intercept two Yokusuka D4Y4 Judy aircraft that are stalking a burning picket. The painting above depicts the destruction of the first Judy after Bill had flamed it and just before it crashes into the sea with a violent explosion. With only one gun still operational, Bill dispatches the second Judy after dark. Bill’s is awarded the prestigious Navy Cross for his 5th and final victory, followed by his very first carrier landing at night.